College advising at Collegiate provides an example of the personal attention that can be found in a small school. The emphasis is on individualized counseling and the overall development of each boy through a rigorous and honest self-evaluation and leadership in the decision-making process. If the student does justice to his research efforts and self-assessment, a successful match most likely will follow. The director of college guidance meets regularly with students beginning in the spring of their junior year, guiding them in all facets of the college admissions process. The college advisor also maintains professional relationships with admissions colleagues at colleges and universities to support the interests of Collegiate's students. Collegiate students are known for the marked maturity with which they approach their college search. They maintain a healthy perspective and are genuinely empathetic toward one another throughout this complex process. This combination of thorough procedures and searching attitudes leads Collegiate students into successful and rewarding college experiences. 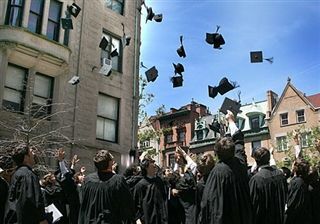 For many years, Collegiate graduates have distinguished themselves on a variety of levels at residential colleges and universities throughout the nation. All members of the junior class take the College Entrance Examination Board SAT Test and most students take at least two Subject Tests. During the last decade, average scores on both tests have been consistently well above the ninetieth percentile for college-bound seniors in the United States. Much of the course work in the eleventh and twelfth grades is of an advanced nature and many students in these courses choose to take Advanced Placement examinations in order to apply for advanced standing in college. In a typical year, more than half of the juniors and seniors will write examinations in a wide variety of subjects. Over the past ten years 95% of these examinations resulted in honor grades, often gaining college credit at many undergraduate institutions.